WAM’s press statement can be found here and the Beige Book can be found here. Be sure to follow AHEC at Facebook.com/TheAHEC. Recent economic data is demonstrating that ObamaCare is leading employers to reduce employees’ hours to exempt the employee from many of the coverage requirements of ObamaCare. The move is the only option for many employers to avoid the disasterous impact of ObamaCare on things such as rising premiums and $2,000 per employee fines under ObamaCare. Circle K, Regal Entertainment, AAA Parking are among the employers who have announced their intent to shift employees to part-time work schedules. Be sure to follow AHEC on Twitter @TheAHEC and at Facebook.com/TheAHEC. By a vote of 79 to 20, the United States Senate voted to repeal part of ObamaCare as part of the budget process. 33 of the Senate’s 53 Democrats voted with 45 Republicans to repeal ObamaCare’s 2.3% xcise tax on medical devices. The tax has been criticized for hampering innovation and job creation. This is the second instance in which Democrats have voted to repeal part of ObamaCare’s revenue raisers. Congress previously repealed the onerous small business 1099 tax measures. So, for the second time in recent years, Congress has voted against two different ObamaCare revenue measures because they proved unworkable and damaging to job creation. Repeal of these measures undermines the political claims that ObamaCare was “paid for” as the “pay fors” now appear to be nothing more than budget gimmicks that were sure to be repealed later. 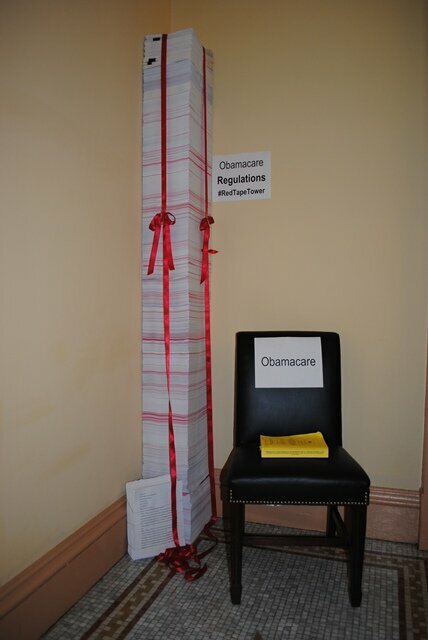 Senate Republicans have stacked each page of ObamaCare regulations into a single stack of paper. The tower of regulations, which are hurting job creation, increasing costs, increasing the uninsured, imposing new taxes, reaches 7 feet, 3 inches in total height. According to The Examiner, a Washington, D.C.-based newspaper, the annual cost of ObamaCare to individuals and businesses will reach $1.8 trillion per year. The paper cites a study by the Competitive Enterprise Institute. Read more from The Examiner here.